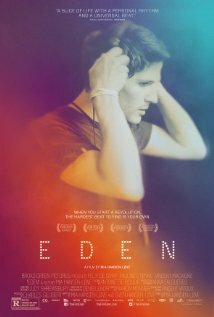 Movie Review: “Eden” is a poignant drama that plausibly evokes the Parisian electronic dance music of the 90’s, being the fourth feature from the creative and always interesting filmmaker Mia Hansen-Love, who co-writes with her DJ brother, Sven, loosely based on his experiences. Félix de Givry responds with resolution to his first main role, playing Paul Vallée, a teenager who gives up finishing his studies to become an established DJ in the Paris underground dance scene, environment that offers him as much drugs and girls as he wants. Adopting the Chicago’s garage style (a blend of house and disco), Paul and his friend Stan form a duo called ‘Cheers’, supported by the depressive Cyril who draws the covers for their records, while other two friends start the acclaimed group ‘Daft Punk’. Regardless being a sensation, the reckless super-hip nightlife boy, unable to control his outgoings, falls into debt and becomes a cocaine addict, ultimately resorting to his mother’s financial help to get back on the right track. Among his numerous girlfriends, which include an American who decides to return to NY and a party-lover bourgeois who wants to spend the money he doesn’t have, there is one that keeps returning over and over – Louise, a flirty girl who never hid her attraction for Paul. However, jealousy, stagnation, and instability frustrate the chances of a more serious commitment. As hypnotic and contagious as the rhythms we listen to, “Eden” evinces an astounding realism, incorporating the characters, images, and music with zest, and ultimately composing a slice of real life whose course takes us from the euphoria of a successful youth to the sadness of its disappearance, together with the awareness that it’s time to grow up and assume responsibilities. By the end, in one of the strongest scenes, Paul, already clean of drugs, looks at a young female DJ with stupefaction and nostalgia. The siblings Hansen-Love assured that the time hops in the narrative work out seamlessly.